Brian Young, aka Mr Puzzle has been creating special Limited Edition puzzles around the end of the each year since 1993. Back in December he announced this year’s Limited Edition would include a new sequential discovery puzzle of his own design. The description promised something special based on a cricketing theme that Brian’s been working on since the issue of a Donald Bradman commemorative 20 cent coin in 2001. It also promised “a lot of steps including three major locks and more different puzzles, locking mechanisms and tools than Brian has ever incorporated into a single puzzle before”. Thinking about this puzzle quickly deteriorated into an internal conversation about ‘when’ rather than ‘whether’ I’d be buying one … it arrived just before the Easter weekend. 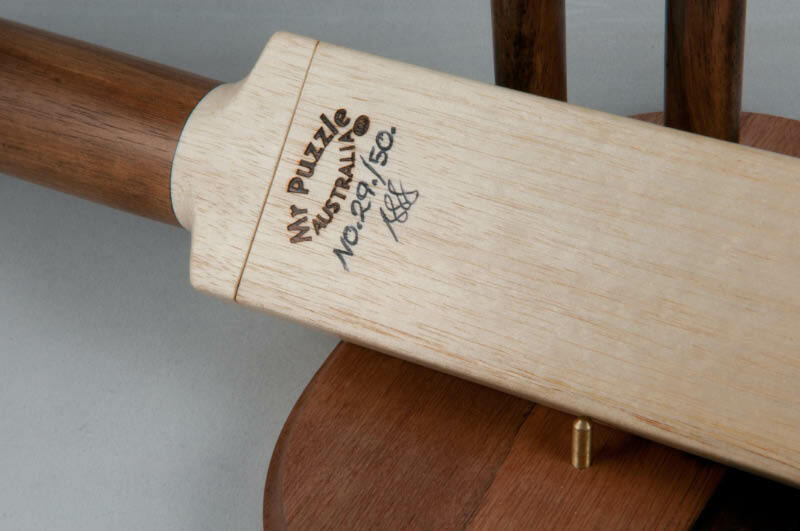 It’s not a small puzzle… an Opening Bat is never going to disappear in among a collection of puzzles – it is going to stand out, in a number of ways. For one thing, it’s a cricket bat and a set of stumps! 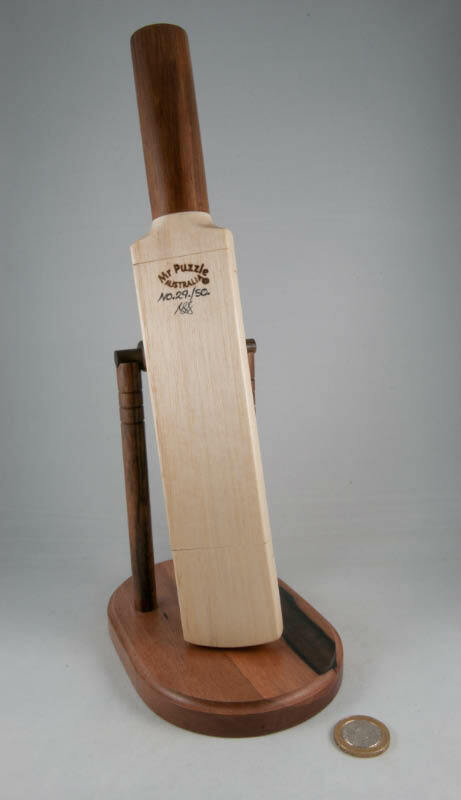 It might not be made of willow (it’s Queensland Silver Ash) but it sure looks like a little cricket bat – the shape’s spot-on and the coin inlaid into the top of the handle looks excellent. 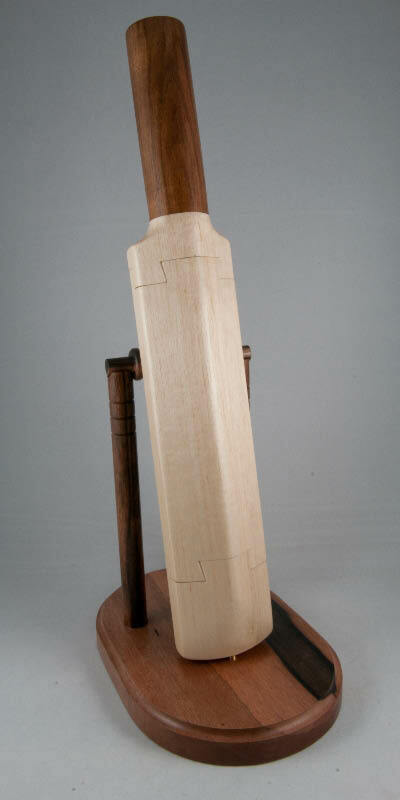 The stumps and oval are made from lovely bits of really interesting Papua New Guinean Ebony. 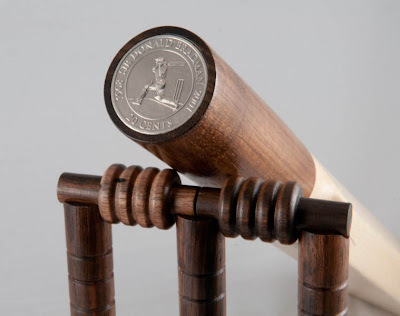 On the face of it, you get a wooden bat, with a few confusing looking joints in it – we’ll worry about those later – and an oval-shaped base with the stumps and bails on it – the only bits of metal you can see are the commemorative coin in the handle and a pin sticking out of the oval base that the bat stands on (so when it looks like its leaning up against the stumps, it’s actually resting on this crafty little pin in the base). Having removed the first section of bat, you’re greeted by an interesting array of metalwork in the next section – helpfully at this stage I have a couple of unused tools from earlier, so working out what to do here doesn’t take too long – with some of the progress yielding even more interesting tools – several of which ‘interact’ with the previous round of tools – all of which is interesting, but releasing tools is one thing, this isn’t getting us past the next lock – having explored all that you seem to be able to do, the second weird dovetail is still solidly locked together. At this point, we exercise the little grey cells a bit more and the little fingers a bit less – and then start experimenting seriously with the tools and find all manner of ways to assemble new and interesting devices from them, and eventually a penny drops, along with something magnetic (Brian did warn there were quite a few of those!) – which then lets you exercise your new creations in a different way, unlocking the second dovetail...which effectively leaves the handle and the shoulder of the bat – and I’m probably not giving anything away by saying this – there’s a small hole at the one end and that’s it – no other way in – and blowing / sucking does nothing (sometimes it’s worth trying that with Brian’s creations, trust me!). Right, so I have a pile of tools, some of which I know I’ve found a use for already, some of which I haven’t. Some of them will fit into the hole in the bottom of the handle, some won’t – all appear pretty useless ... remembering there are some magnets, we explore those a bit and quickly establish that there are magnetic things in the handle – yay – playing around with the magnets doesn’t seem to do much use or really teach you much about the innards either, to be honest. So I prod and poke and screw and unscrew things, all to no avail... and at this point in the story, I takes a bit of a break to spend time with family and friends and don’t do an awful lot of puzzling – so I make zero progress for a couple of weeks... in the meantime I read on the inter-web that a couple of the leading lights in the puzzling community are finding it tough cracking this one as well (I take a little comfort!) – although Brian Pletcher manages to crack it reasonably efficiently (3 hours!!) – but I reckon he’s really a puzzle-cracking robot in disguise! So back to the pile of tools this puzzle has delivered, combine a couple of the stranger ones and set about testing the theory ... and at first, there’s nothing different, but then something changes and from there on out this puzzle puts a huge smile on your face – because the last lock opens with such a flourish that it’s like holding a little piece of theatre in your hands as it plays out the final act – glorious stuff! All up, I reckon I must have spent about 6 hours solving this one – if it’s not already clear, I think it’s an epic puzzle. The sequential discovery elements keep you finding new stuff and giving you new alleyways to explore – there are plenty of surprising little puzzles to solve along the way, including a number that are disguised and easy to overlook – however, unless you not only find them all, but also solve them all, you don’t progress and you find your path barred. And that final solve is choreographed beautifully – it tells you that you’ve arrived and rewards you all at the same time. Brian Young, you ought to be proud of this, very proud! Oooh! I really really want one of these. Unfortunately the price is out of my league. Thanks for the vicarious experience. Sounds like a great puzzle. Whether I can convince my other half to let me have one is another story though. Great review. Thanks for sharing!